It sounds like a delivery van. 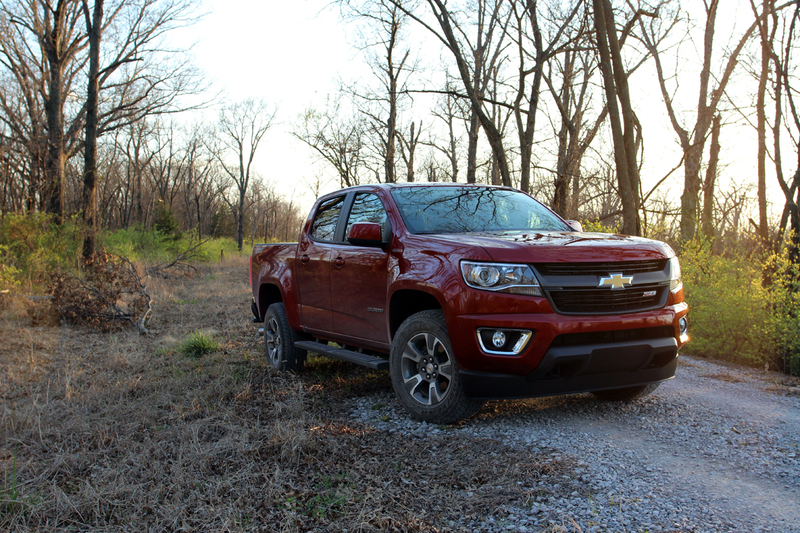 That phrase has been a common remark while driving the 2016 Chevrolet Colorado diesel. No one ever expects such a throaty, diesel-induced clank, clank, clank from this little pickup. Frankly, it’s a foreign noise to the American ear. The good news is that the Colorado diesel is anything but a mundane, utilitarian delivery vehicle. Instead this is a little pickup with a big personality and anyone in the market for a pickup should take note. Perhaps only those of us with gasoline (diesel?) 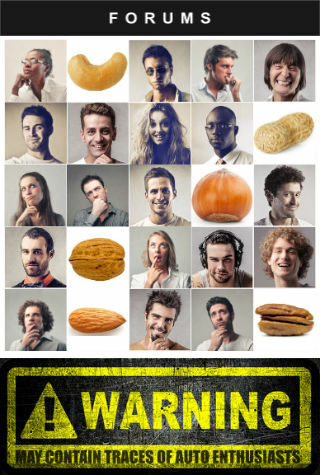 in our veins can relate to this, but oftentimes vehicles exhibit a sort of personality. They blur the dichotomy that rests between man and machine by animating traits and providing a sense of purpose in one’s life. In the case of this Colorado, it is difficult not to love this truck. By today’s standards it’s physically compact, but the diesel makes these big-truck noises… basically this truck is like an adorable puppy. Let’s start by figuring out how the Colorado diesel even got here. The truck has been out for over a year now, with two gas engines running the show. 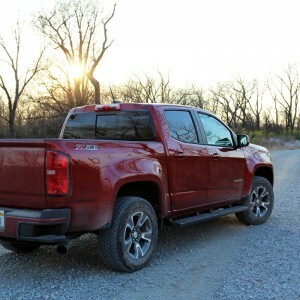 Now the fact that GM even gambled on the dead-on-the-vine midsize truck segment at all is shocking, but bringing a diesel engine to the segment is nothing short of astonishing. Both gasers have received decent fanfare since launch, though the four-cylinder and V-6 are both mediocre compared to what could be offered in the truck. 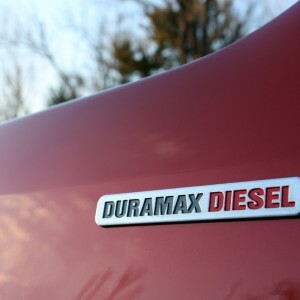 Enter the Duramax 2.8-liter four-cylinder turbo diesel, which completely changes the dynamic. GM’s latest generation of pickups can best be summed up as handsome fellas. 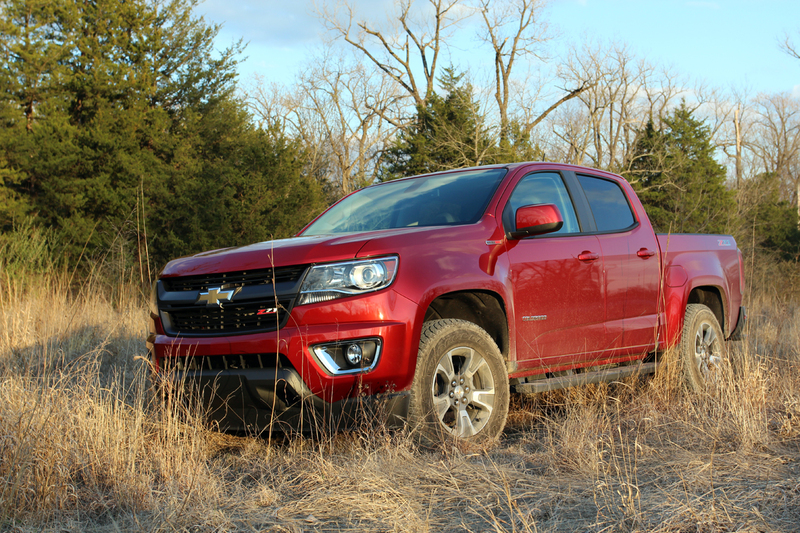 Like the half-tons, the Colorado design is not overdone. Instead, it looks its part: the younger brother of the truck family. Our red crew cab tester managed to look at home both on the street and off-road. 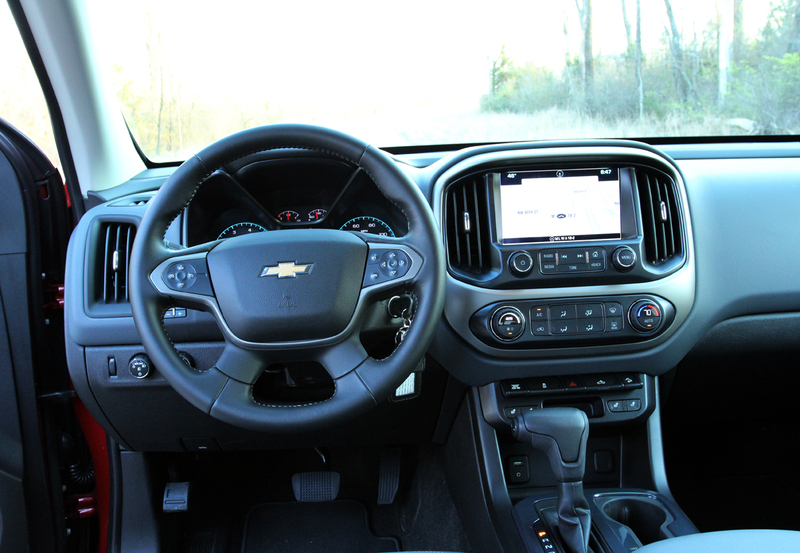 The exterior design of this truck manages to pull off urban-chic, but provide enough toughness that comes from the athletic stance and the optional blacked out grille that’s part of the Z71 trim. 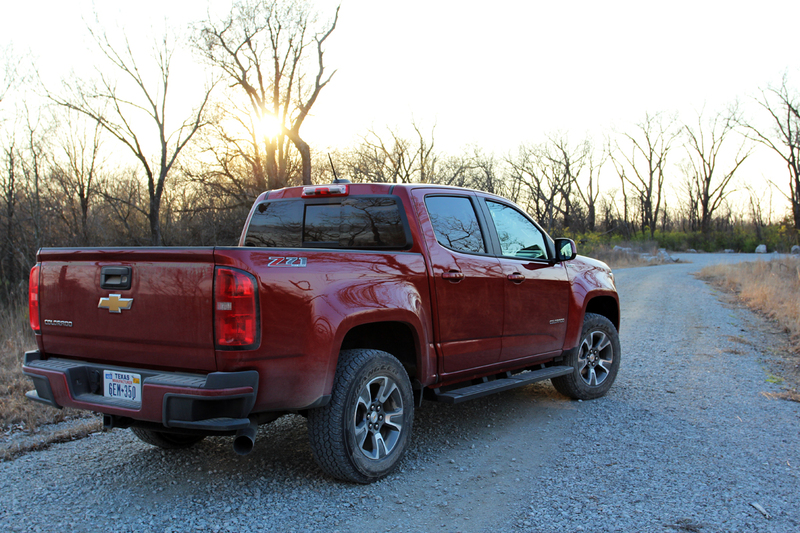 The Z71’s off-road credentials were put to use during our testing. A legacy in the southeast corner of Kansas is the practice of “strip mining” of lead and zinc around the time of WWII. This practice has resulted in several state-run wildlife areas, which proved the perfect setting to adequately test the Colorado diesel (and provide some nice photos). It was a mild evening in March, which is around the time the heartland begins to see some stunning sunsets. 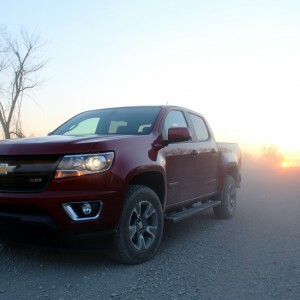 The Colorado trekked through the dirt roads, layered with the byproduct of the aforementioned mining to locate some of the off-road areas that can be driven on without the hassle of paranoid land owners. With the windows down, the diesel puttered through the cabin as if it too was soaking up the scenery. Dust began to coat the dash, which is a mini-me of the Silverado. 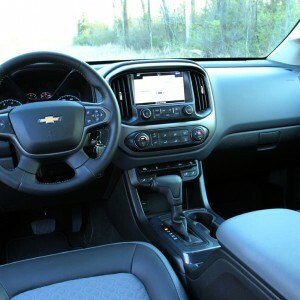 While a generally nice interior, Chevy forces this strange mix of fake leather and cloth seats on the Z71. It’s both unattractive and chintzy. 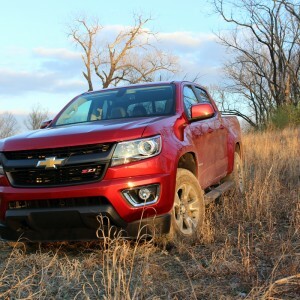 Diesels aren’t known for speed, and the Colorado is no exception. 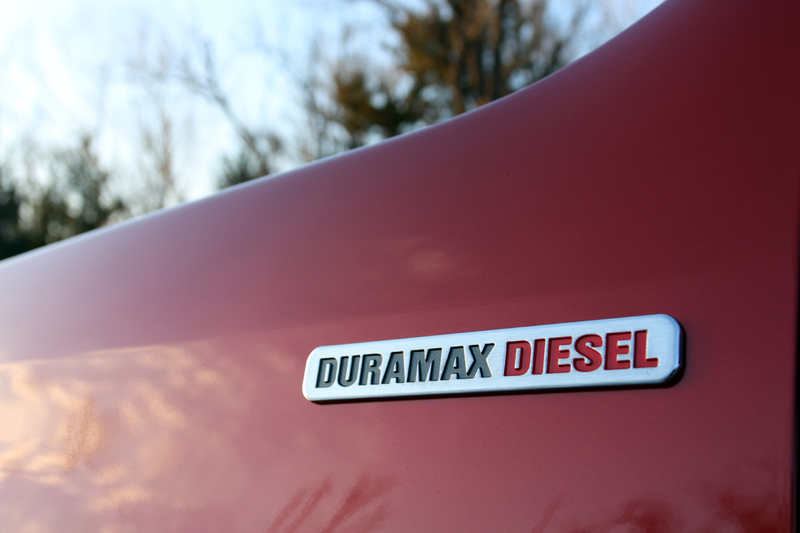 The baby Duramax features 181 horsepower and 369 pound-feet of torque. Both digits became readily obvious on long stretches in the wilderness. The diesel’s acceleration isn’t unlike the four-cylinder gas version of the truck, but at least this one sounds more interesting. Once it’s up-to-speed, the torque takes over and saves itself from giving the perception that it’s a total dog. From about 2,000 rpm and up, the truck starts to surge ahead thanks to the abundance of torque. 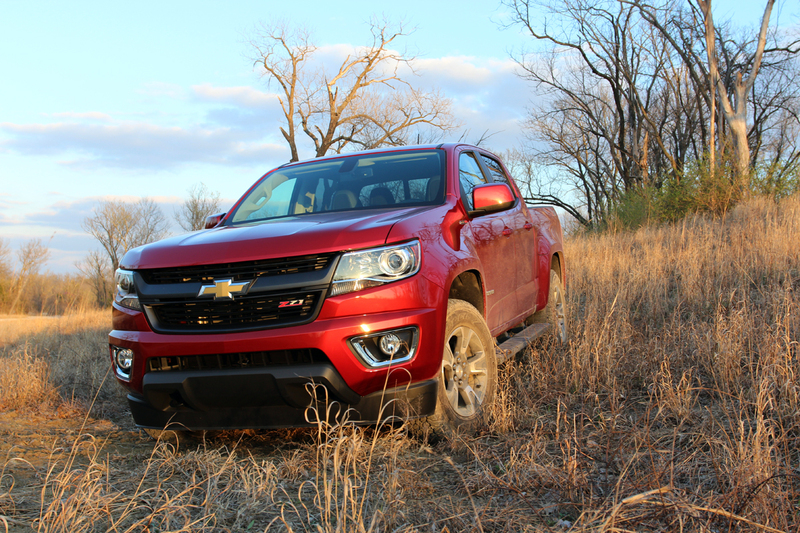 That torque also gives this engine the Colorado’s largest towing rating, matching the V-6 Silverado at 7,600 pounds. Commonalities with the larger half-tons is, well… common with the Colorado. 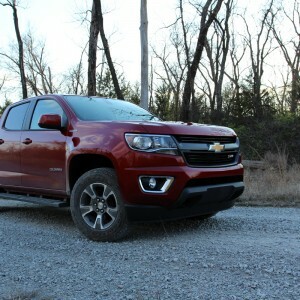 Trekking over the wash-boarded rural roads of Kansas exemplified the fact the Colorado chassis is essentially a scaled down version of the half-ton setup. Engineering principles such as a fully-boxed frame and hydraulic cab mounts have trickled down to the little truck, giving it an equally comfortable ride and capability. 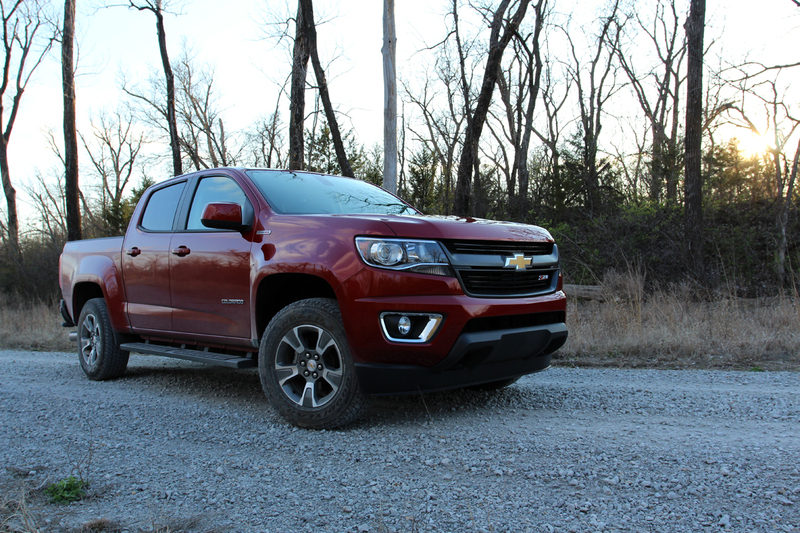 Flipping over a Colorado and Silverado will literally yield nearly identical chassis geometry. Where the Colorado begins to show up its big brother is off-roading. 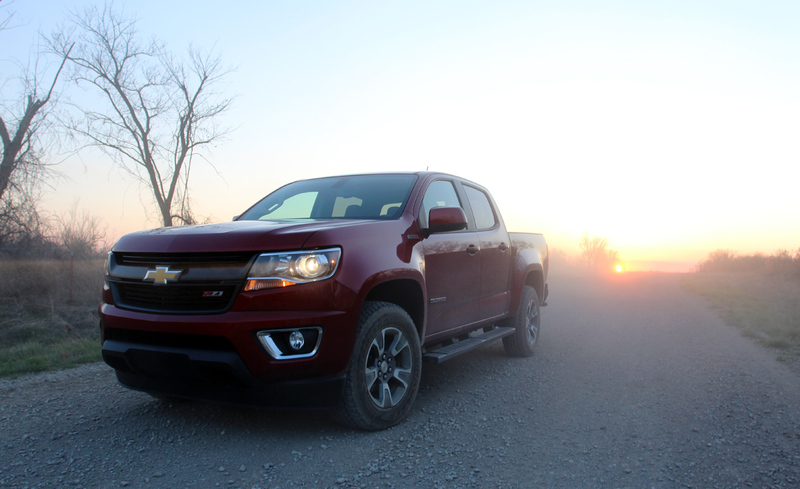 With 15-inches gone from wheel to wheel over the Silverado, the Colorado is significantly easier to maneuver on tight trails and steep inclines. It’s no Wrangler, but the slow churning, torque-intense diesel and hill-descent control (borrowed from the half-tons) prove to be far more fun. The nicely-tuned electric steering and two-speed four-wheel drive round out a pretty great experience. It’s a pleasing experience on-road as well. 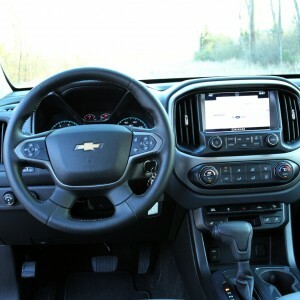 A near 100-mile quick trip to the airport proved just as comfortable as GM’s well-mannered half-tons. Ride quality is nearly on-par, though the smaller wheelbase does cause more bumps to enter the cab. Wind noise, too, is more noticeable in this truck as it lacks luxuries such as the laminated glass found in GM’s fancier truck offerings. Still, Colorado manages to be a smoother highway cruiser than even the last generation half-tons from any brand and way more maneuverable on and off-road. 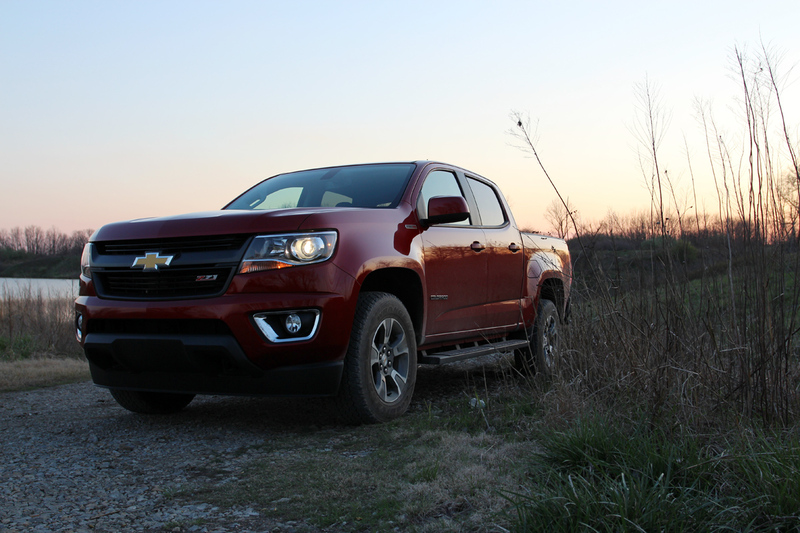 The trip to the airport drove home another critical point with the Colorado: it’s a fuel economy champ. EPA ratings are officially at 20 mpg city and 29 mpg highway, both impressive figures in their own right. However, this is one of those instances where meeting or exceeding EPA ratings is highly-achievable. We consistently saw highway figures in excess of 30 mpg. Even when off-roading and trying to just kill fuel economy, the baby Duramax refused to guzzle too much diesel. Great fuel economy is a plus as it subsidizes the diesel option cost. At minimum the Duramax costs an extra $3,905 over the comparable gas version. Add options such as navigation system, heated steering wheel and all of the other luxuries we’ve come to expect and mid-$40,000’s is not hard to achieve. Then again, we live in a world where half-tons are hitting as much as $70,000, so perhaps that’s not that bad? The cost equation comes down to less about the feature and content and more about what kind of utility you need from a truck. The half-tons are ridiculously comfortable, bank-vault quiet and can haul about anything the average buyer can throw at it. They are within a different league of capability and feature content than this Colorado, but that’s part of the appeal with this truck. That’s the thing with the Colorado. It’s a truck that has the mechanics to go play out in the Kansas wildlife lands with ease and 4G LTE, but can take folks to on the 90-mile trek to the airport in comfort and sip fuel in the process. Here’s where that dichotomy between man and machine becomes blurry, because this little truck manages to do a lot of things really well and in a way no other truck can. That’s why the Colorado diesel gets our vote as being worthy of consideration for nearly anyone who thinks they need a truck. Unless you just absolutely need half-ton capability, it’ll be just like that favorite family pet – reliable and deserving of your affection. 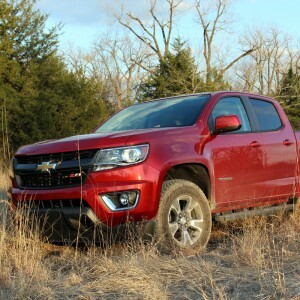 The more I see these Colorados (tho, not necessarily the Diesel edition), the more I would love to have 1 ... & this comes from someone who prefers older vehicles. 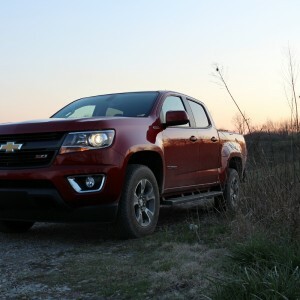 I test drove a 4x4 3.6 Colorado a few weeks ago, as it's on the short list of candidates for our driveway. Acceleration was descent for a truck, and while it felt a bit not ponderous to me around the few turns I got to experience, the ride and comfort quotient was off the charts. I really wanted to drive the diesel, however, the dealer indicated that they sell within a day or two of arriving, so I'll have to get down there quickly if I want to experience one. I want to experience first-hand the torque offered up by the oil-burner before making a buying decision. I just checked it. It works. It's good to read that the Colorado/Canyon can hit 30 MPG. Too bad GM can't put that in advertisements. For some reason, I can't get the full article to pull up on my laptop. Can you give it another try? The link in the footer wasn't cooperating. It sounds like a delivery van. 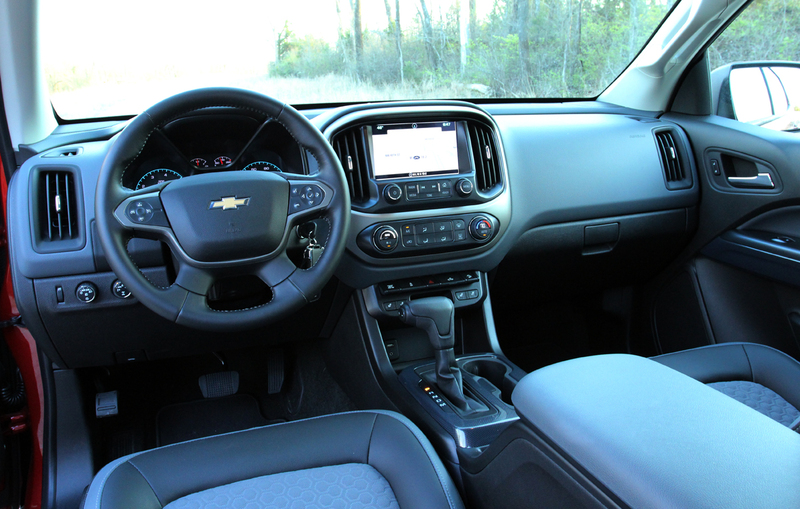 That phrase has been a common remark while driving the 2016 Chevrolet Colorado diesel. No one ever expects such a throaty, diesel-induced clank, clank, clank from this little pickup. Frankly, it’s a foreign noise to the American ear. The good news is that the Colorado diesel is anything but a mundane, utilitarian delivery vehicle. Instead this is a little pickup with a big personality and anyone in the market for a pickup should take note.Perhaps only those of us with gasoline (diesel?) in our veins can relate to this, but oftentimes vehicles exhibit a sort of personality. They blur the dichotomy that rests between man and machine by animating traits and providing a sense of purpose in one’s life. In the case of this Colorado, it is difficult not to love this truck. By today’s standards it’s physically compact, but the diesel makes these big-truck noises… basically this truck is like an adorable puppy. 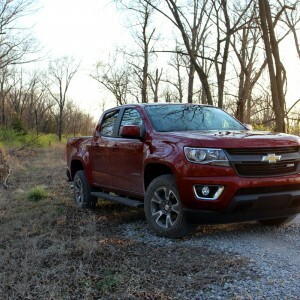 Summary: If you want a truck, you want to consider this Colorado.